Descriptors: early maladaptive schemas, migraine, psychological profile. Descritores: Esquemas iniciais desadaptativos, migrânea, perfil psicológico. 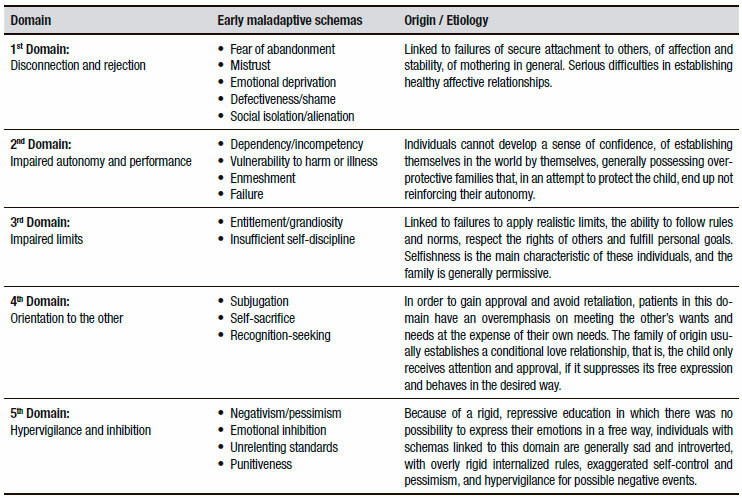 Young's early maladaptive schemas questionnaire (YSQ-S3) is used to understand psychological aspects. OBJECTIVE: EMSs were evaluated in patients with migraine. METHODS: Sixty-five subjects were evaluated using the YSQ-S3 under standard conditions in a room with air conditioning at 22 ± 2°C. 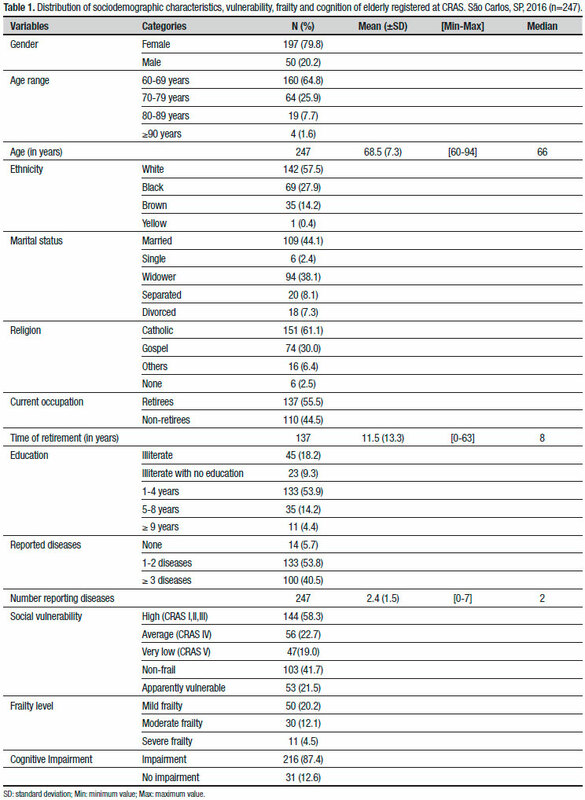 The subjects were stratified by morbidity (migraine), gender (male/female) and age (18-29 / 30-39 / 40-55). Controls (without migraine), n = 27 and patients (with migraine), n = 38, men (n = 19) and women (n = 46); participants aged 18-29 years, n = 34, aged 30-39 years, n = 14 and aged 40-55 years, n = 17. Data were analyzed using the Chi-square test, with p-values <0.05. Results were expressed as percentages in contingency tables. RESULTS: There was a significant association between migraine and female gender (84.21%; p-value <0.05, Table 1), between hypervigilance and inhibition, and unrelenting standards (56.52%; p-value <0.0.014, Table 2) and female gender with migraine. Moreover, there was a significant association between hypervigilance and inhibition, and unrelenting standards (73.68%; p-value <0.0001) and self-punishment (84.21%; p-value <0.0001) in patients with migraine of both genders (Table 3). CONCLUSION: The individuals with migraine had a psychological profile of being overly demanding with themselves and others and self-punishing, where this was more frequent in women. O questionário de esquemas iniciais desadaptativos de Young (YSQ-S3) é usado para se entender aspectos psicológicos. OBJETIVO: Os EIDs foram avaliados em pacientes com migrânea. MÉTODOS: Sessenta e cinco indivíduos foram avaliados utilizando YSQ-S3 sob condições padrão em uma sala com ar condicionado a 22 ± 2°C. Os sujeitos foram estratificados pela morbidade (migrânea), por gênero (masculino/feminino) e por idade (18-29 / 30-39 / 40-55). Controle (sem migrânea), n = 27 e com migrânea, n = 38, homens (n ​​= 19) e mulheres (n = 46); indivíduos com idade entre 18 a 29 anos, n = 34, entre 30-39 anos, n = 14 e entre 40-55 anos, n = 17. Os dados foram analisados ​​usando o teste do qui-quadrado, com valores p <0,05. Os resultados foram expressos em porcentagens em tabelas de contingência. RESULTADOS: Houve associação significativa entre migrânea e gênero feminino (84,21%; p-valor <0,05, Tabela 1), entre hipervigilância e inibição, e padrões excessivamente rígidos ​​(56,52%; p-valor <0,0,014, Tabela 2) e gênero feminino com migrânea. Além disso, houve associação significativa entre hipervigilância e inibição, e padrões excessivamente rígidos ​​(73,68%; p-valor <0,0001) e autopunição (84,21%; p-valor <0,0001) em pacientes com migrânea de ambos os gêneros (Tabela 3). CONCLUSÃO: Os indivíduos com migrânea têm um perfil psicológico de serem excessivamente exigentes consigo e com os outros e de se autopunirem, sendo isso mais frequente em mulheres. This work was approved by the local Research Ethics Committee (CAAE Number #1.383.600 on January 5, 2016). Before data collection, all the subjects signed informed consent forms and all the women ensured that they were not in the pre-menstrual period and in the prodromal period of the migraine on the day of the assessment. • 6 = describes me perfectly, that is, it has everything to do with what happens to me. Data analysis was carried out using the SIGMA STAT computer program for Windows - Version 2.0 (Jandel Corporation). The results were analyzed using the Chi-square test, with a p-value <0.05 considered statistically significant. Results are expressed as percentages and represented in contingency tables. 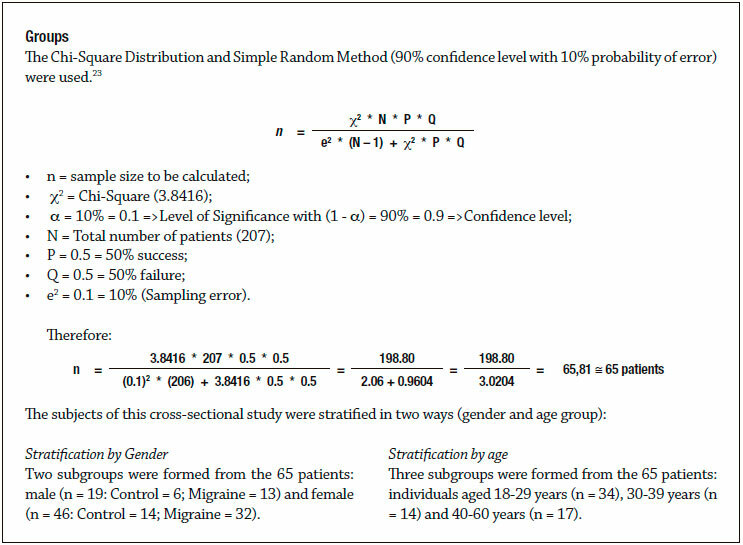 There was a statistically significant association between migraine and female gender (84.21%; p-value <0.05 - Table 1). There was a significant association between hypervigilance and inhibition and unrelenting standards (56.52%; p-value <0.0.014) and female gender in patients with migraine (Table 2). There was a significant association between hypervigilance and inhibition and unrelenting standards (73.68%; p-value <0.0001) and self-punishment (84.21%; p-value <0.0001) in female patients with migraine (Table 3). This study found a significant association between migraine, female gender, hypervigilance and inhibition, unrelenting standards and self-punishment. Although the designations of unrelenting standards and self-punishment, which are EMSs linked to the hypervigilance and inhibition domain, were used in this study, it is important to clarify that these findings were not specifically of the EMSs, because they did not meet the requirements established by Young et al. 19 on the response screen, as the expected means for this classification should be above an average of 5.0. Karl Jaspers affirms that personalities that make people and those around them suffer are not normal. According to Jaspers, abnormal personalities represent non-normal variations of human nature, which can be perfectly understood as personality disorders.30 However, 'way of being' for this study was not in this context, because the subjects appeared to affect only themselves with the discomfort of migraine. Author contribution. Ketlin Helenise dos Santos Ribas: participated in the writing of the entire text, in data collection and statistical analysis. Silano Souto Mendes Barros: contributed to writing of the Introduction and was involved in the data collection. Valéria Ribeiro Ribas: assisted in data collection and sample calculations. Maria da Glória Nogueira Filizola: assisted in the data collection and devising of the methodology. Valdenilson Ribeiro Ribas: helped in the textual organization of the Results and the Discussion and also contributed to the statistical analysis and was the corresponding author. Renata de Melo Guerra Ribas: assisted in data collection and statistical analysis. Paulo César da Silva: assisted in the data collection and in the searching and organization of references. Hugo André de Lima Martins: assisted in data collection and oversaw the overall study as Advisor. 1. Wohlin Wottrich A, Stenström CH, Engardt M, Tham K, Von Koch L. Characteristics of physiotherapy sessions from the patient's and therapist's perspective. Disabil Rehabil. 2004;26(20):1198-205. 2. Price DD. Psychological and neural mechanisms of the affective dimension of pain. Science. 2000;288(5472):1769-72. 3. Fleming-McDonnell D, Czuppon S, Deusinger SS, Deusinger RH. Physical therapy in the emergency department: development of a novel practice venue. Physical Ther. 2010;90(3):420-6. 4. Leite EM (editores). Alodinia em pacientes com cefaleia em salvas e migrânea. 2012. 5. Morais TC (editores). Efeito analgésico, antiinflamatório e gastroprotetor dos ácidos anacárdicos, isolados de anacardium occidentale l., em modelos experimentais; 2010. 6. Klaumann PR, Wouk A, Sillas T. Patofisiologia da dor. Arch Veter Science. 2008;13(1). 7. Craig KD, Prkachin KM. Nonverbal measures of pain. Pain measurement and assessment. 1983;29:173-82. 8. Chapman WP, Finesinger JE, Jones CM, Cobb S. Measurements of pain sensitivity in patients with psychoneurosis. Arch NeurPsych. 1947; 57(3):321-31. 9. Lynch-Jordan AM, Kashikar-Zuck S, Goldschneider KR. Parent perceptions of adolescent pain expression: The adolescent pain behavior questionnaire. Pain. 2010;151(3):834-42. 10. Vlaeyen JW, Linton SJ. Fear-avoidance and its consequences in chronic musculoskeletal pain: a state of the art. Pain. 2000;85(3):317-32. 11. Woby SR, Urmston M, Watson PJ. Self-Efficacy mediates the relation between pain-related fear and outcome in chronic low back pain patients. Eur J Pain. 2007;11(7):711-8. 12. Tazawa N. Modelagem da dor utilizando-se redes neurais artificiais: Universidade de São Paulo; 2006. 13. Sava FA. Maladaptive schemas, irrational beliefs, and their relationship with the five-factor personality model. J Cogn Behav Psychother. 2009;9(2):135-147. 14. Teixeira DCA. Esquemas iniciais desadaptativos e ajustamento psicológico em crianças e adolescentes; 2010. 15. Mason MF, Norton MI, Van Horn JD, Wegner DM, Grafton ST, Macrae CN. Wandering minds: the default network and stimulus-independent thought. Science. 2007;315(5810):393-5. 16. Boyer P. Religious thought and behaviour as by-products of brain function. Trend Cogn Sci. 2003;7(3):119-24. 17. Verkhratsky A, Parpura V, Rodríguez JJ. Where the thoughts dwell: the physiology of neuronal-glial "diffuse neural net". Brain Res Rev. 2011;66(1):133-51. 18. Ohno T, Hasegawa T, Tsuruoka T, Terabe K, Gimzewski JK, Aono M. Short-term plasticity and long-term potentiation mimicked in single inorganic synapses. Nat Mater. 2011;10(8):591-5. 19. Young JE, Klosko JS, Weishaar ME. Schema therapy: A practitioner's guide: Guilford Press; 2003. 20. Freeman A, Freeman S. Understanding schemas. Encyclopedia of Cognitive Behavior Therapy. 2005:421-6. 21. Kraus JF, McArthur DL. Epidemiology of brain injury. Neurol Trauma. 1996;2:3-18. 22. Pinto Gouveia J, Rijo D, Salvador M. A versão portuguesa do Questionário de Esquemas de Young. Não publicado. 2005. 23. Kothari CR. Research methodology: Methods and techniques: New Age International; 2004. 24. Beck AT, Freeman A, Davis DD. Cognitive therapy of personality disorders: Guilford Publications; 2015. 25. Medeiros LMV, Ribas VR. Early maladaptive schemas of women who are victims of domestic violence in pernambuco/brazil. Neurobiologia. 2014;77:1-2. 26. Larsen RJ, Buss DM. Personality psychology. Jastrebarsko: Naklada Slap. 2008:269-71. 27. Silva SdS, Pereira RC, Aquino TAAd. A Terapia cognitivo-comportamental no ambulatório público: possibilidades e desafios. Rev Bras Terap Cogn. 2011;7(1):44-9. 28. 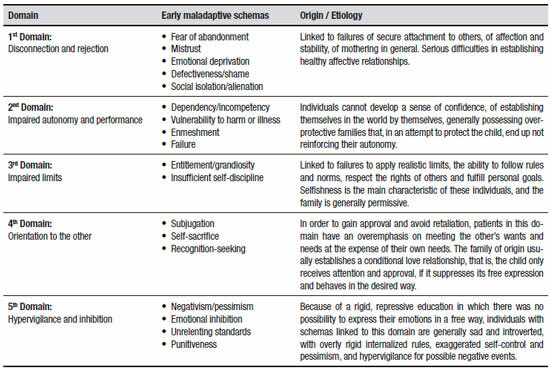 Lavergne F, Marie N, Mehran F. The 5 mental dimensions identified in early maladaptive schemas statistical analysis of Young's schema questionnaire (YSQ-s3). Encephale. 2015;41(4):314-22. 29. Ey H, Bernard P, Brisset C. Tratado de Psiquiatria: 2* edição. Barcelona, Toray-Masson. 1969:388. 30. Havens LL. Karl Jaspers and American psychiatry. Am J Psychiatry. 1967;124(1):66-70. Accepted in final form December 03, 2017.